The human genome encodes hundreds of G protein-coupled receptors (GPCRs). These form the largest group of receptors through which hormones and neurotransmitters exert their functions on our cells. Therefore, they are of highest importance as drug targets: around half of all prescribed drugs act on these receptors – and thus GPCRs help in the treatment of widespread diseases such as hypertension, asthma or Parkinson. For a long time, scientists were convinced that GPCRs sit at the cell surface and only from there influence the activity of the cell via activation of various intracellular signalling cascades. This belief has been shaken by a series of recent studies. These studies suggest that GPCRs are also active in the cell interior. Researchers led by Professor Davide Calebiro of the Institute of Pharmacology and Toxicology and the Bio-Imaging Center of the University of Würzburg have now provided important support to this theory. The results of their work are presented in the current issue of the journal Nature Communications. In simplified terms, G-protein-coupled receptors sit at the cell membrane waiting for a hormone or neurotransmitter to bind and thereby activate them. The signal is then transmitted inside the cell, mainly through the production of an intracellular second messenger such as cyclic adenosine monophosphate (short cAMP). This second messenger, in turn, is involved in the regulation of a large number of cell functions, such as gene transcription and cell division. 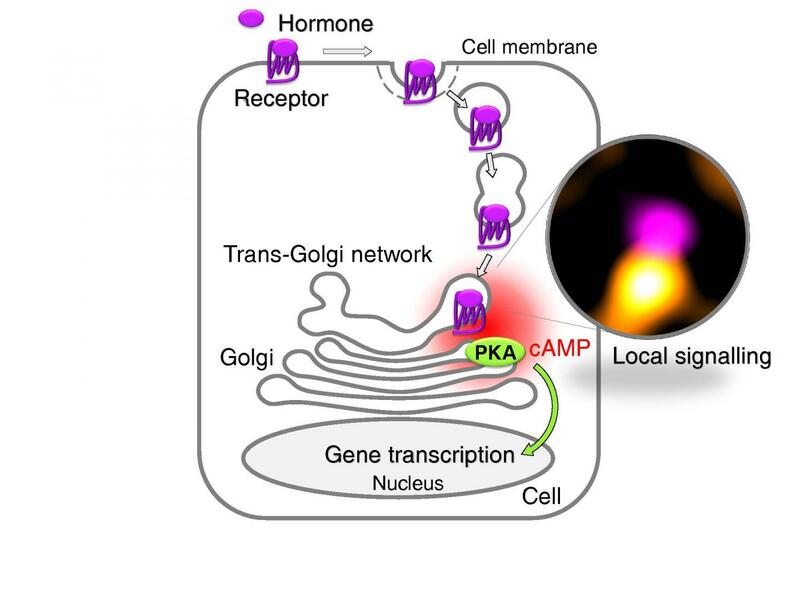 "The first indication that GPCRs also initiate the production of cAMP in the cell interior came from two studies of typical protein hormone receptors," says Davide Calebiro. He and his team were responsible for one of these studies; they had investigated a receptor important for the production of thyroid hormones – the so-called thyroid-stimulating hormone (TSH) receptor. "Those studies independently showed that GPCRs are able to induce a second, persistent phase of cAMP production in the cell interior," said Davide Calebiro. In fact, this phenomenon was shown to be "biologically relevant". However, the exact mechanism was largely unknown. With their latest study, the researchers of the University of Würzburg, together with colleagues from the University of Birmingham, have succeeded in deciphering what is happening in the cell interior. As major player, they identified the trans-Golgi network (TGN), a network of tubules and vesicles associated with the Golgi complex. This is the cell compartment where newly synthesized proteins are sorted into different transport vesicles that carry them to their final subcellular locations. "Our new data show that the TGN is an important intracellular platform for the activity of G protein-coupled receptors," says Davide Calebiro. According to the scientists, their study reveals a new mechanism that explains the effects of GPCR signalling in the cell interior. The newly described mechanism of GPCR signalling inside thyroid cells can be recapitulated as follows: upon TSH binding, TSH receptors are taken up by the cells (internalized) and transported to the trans-Golgi network. There, the receptors induce the production of cAMP and activate another enzyme – protein kinase A. Since these events happen in close proximity to the nucleus, where the genetic information of the cell is stored, they modify gene transcription. "This study represents a significant step forward", affirms Davide Calebiro with confidence, as it presents a new model capable of explaining how GPCRs function inside our cells. These new results could "lead to the development of innovative drugs for a variety of human diseases that specifically target the uptake of receptors or their function in the TGN".